Exhibit and trade show display 10 x 10 truss system designs can be used for structure and decorative accessories. We offer a broad variety of truss designs and sizes as well as custom truss systems that are fast and easy to set up. Our truss designs are available as flat, triangular, or square in terms of its chords. You can also choose from different truss profile sizes depending on the size and stability needed for your truss system. 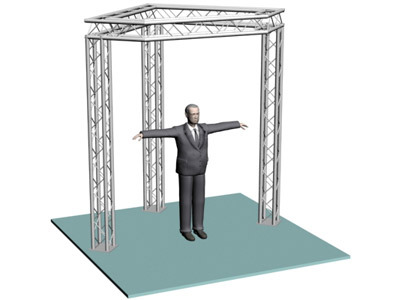 This unique trade show exhibit offers a 10 x 10 10 inch truss with a unique triangular truss structure. Great for exhibit signs and banners! Please visit our photo gallery as we are always happy to display your creative ideas and uses for our aluminum exhibit displays. Contact us today for your next project as we would be pleased to assist you in the design and fabrication of your trade show booth, display or exhibit. Similar to the 4 chord truss, this creative trade show exhibit offers a 3 chord 10 x 10 10 inch truss with a unique triangular truss setup. Need help with a trade show exhibit quote? 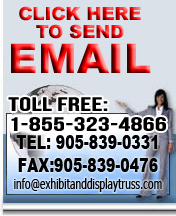 We would be pleased to help in the design of your trade show truss, display or exhibit. Our expert staff will walk you through the many possible options and make your exhibit display project a simple and pleasing experience. To help serve you better and provide you with the best possible value we would need to know some basic information about your needs. The 2 chord exhibit display with a triangular layout is a flexible exhibit structure which offers a great deal of space in your 10 x 10 display booth for tables, signs, or even one of our beautiful Aluminum LCD or Plasma TV Monitor Stands.